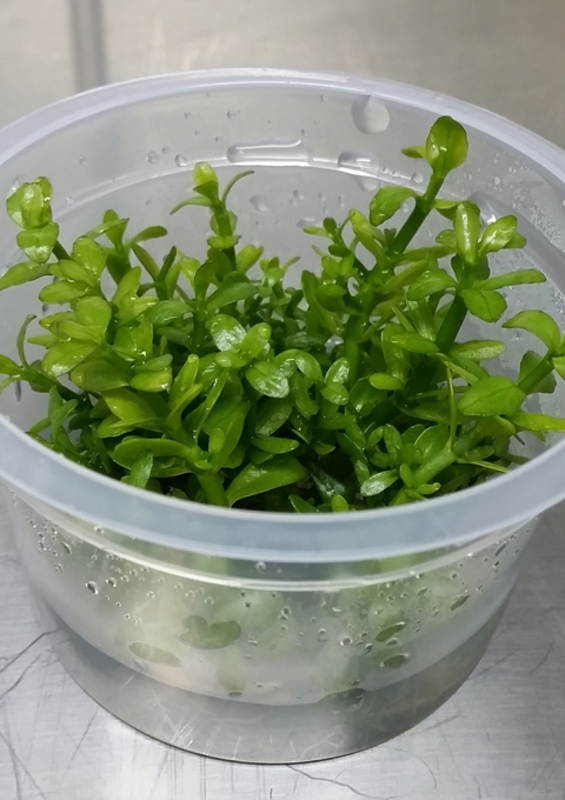 Bacopa monnieri, also known as 'moneywort' among aquarists and 'brahmi' among herbalists, is quite widespread throughout the tropics where it can be found growing along the banks of lakes, rivers, and pools. The plants usually grow as emersed, creeping stems during the dry season during which they tend to produce pinkish flowers at the leaf nodes. During the wet season, the rising water level usually submerges the plants for several months during which they grow in their more familiar, aquatic form. B. monnieri is one of the most common stem plants in the hobby, with its popularity stemming from its ease of growth and unique foliage. B. monnieri is one of the easiest stem plants to grow, as it makes very few demands on the hobbyist other than bright lighting (2 watts per gallon or more). If lighting is not intense enough, the lower portions of this plant tend to rot. CO2 is beneficial, but not necessary it is an excellent candidate for Diana Walstad style non-CO2 aquaria. Although nutrient deficiencies are not readily visible, growth does slow if not enough nutrients are available. In CO2-driven, high-light aquaria, maintaining proper nitrate (5 ppm or more) and phosphate (0.5 ppm or more) will promote faster, more robust growth, as will regularly dosing an iron/micronutrient mix. This undemanding stem plant grows vertically even under very high light conditions. 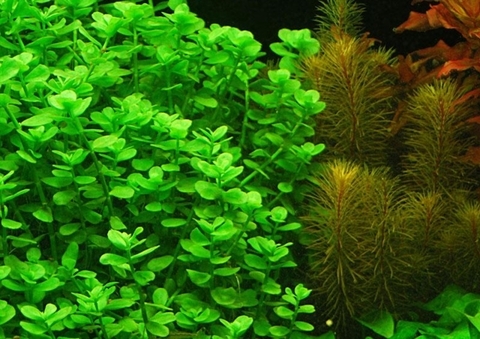 If allowed to grow to the water's surface, it will continue to grow vertically in its emersed form. B. monnieri tends to produce pseudo-runners at the base of the plant, which can either be left in place or clipped off and replanted in the substrate. It also tends to produce side shoots which can be treated like the aforementioned runners. B. monnieri can be used as a background or middleground plant, where its leaf shape and light green foliage make it a good, contrasting accent plant.